So everyday today is my birthday! Yaaay! No, you may not ask how old I am. Instead, I am dedicating the next week of posts to my beautiful birthstone color: emerald green. I have been major crushing on this color lately, and we are pretty sure we are going to use it in our master suite as soon as a get an actual vision for that space. 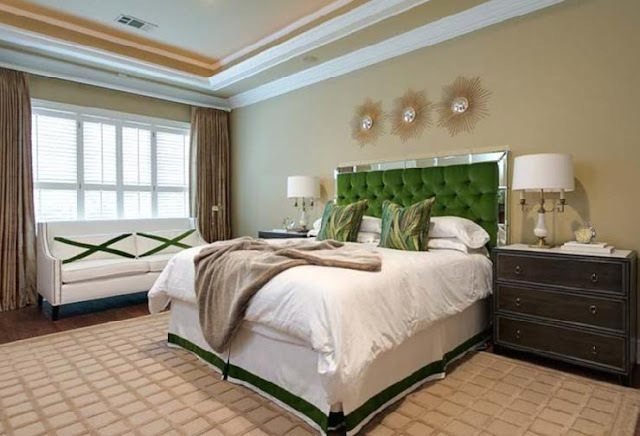 So, for starters, I'll share with you some yummy emerald green bedrooms that I'm digging. 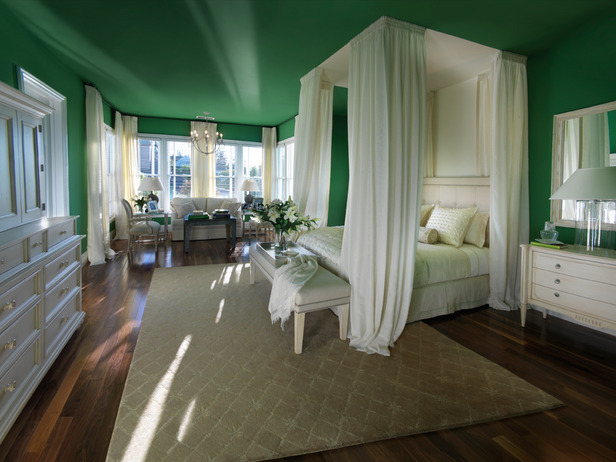 Love how all the white is brought to life with the perfect amount of emerald! It's so clean and fresh! This stencil is awesome! Or is it fabric since there's matching pillows? I would have never considered painting the trim anything other than white! The emerald trim is so fun! Ah, the 2009 HGTV Dream Home. Pretty much my favorite dream home of all. If you missed my rooms that were inspired by this house check out part one and part two. Maybe I'll be adding a part three to that list! 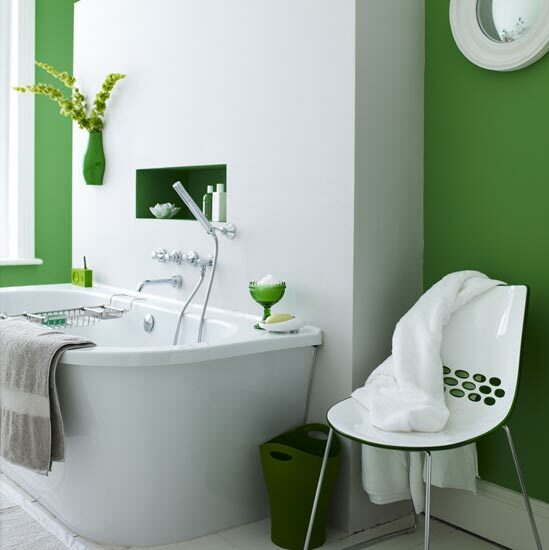 Although, I think any potential buyers might be terrified if they saw this much green! Love, love, loving the emerald headboards! Especially that ultra fine one below! My oh my! I am loving everything about this bathroom, especially the layout! I love how the bathtub is the centerpiece and first thing you see in the room! That chandelier is just the icing on the cake! Where did you find that green patterned wall paper?? I love it and can NEVER find anything so lovely in that perfect shade of green. These are just some inspiration photos of mine. This isn't my actual work. 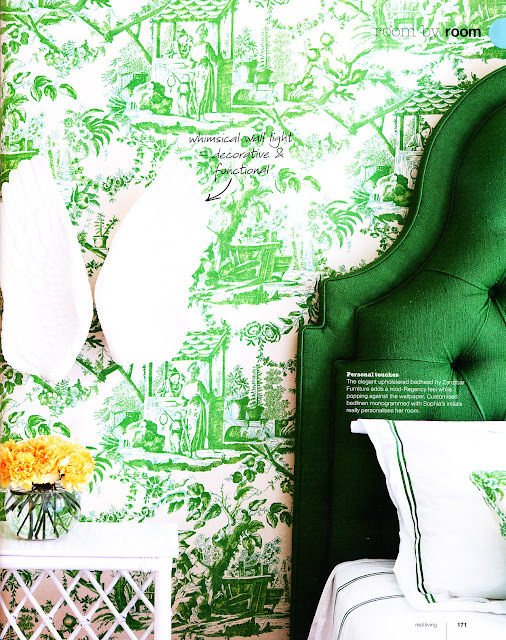 The one with the green headboard I'd guess is wallpaper, but the other one I'm positive is a stencil. Then you can pick whatever green you like!